I present evidence of the underperformance of the CTA group in the last 10 years and statistical analysis to rebut claims that the performance of a group of top 20 CTAs is more representative of this group’s performance. 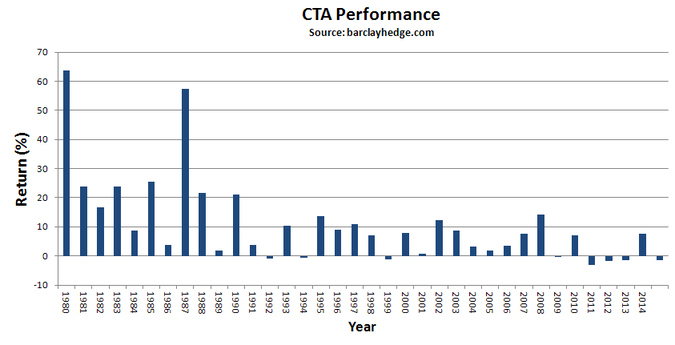 Below are yearly returns from the Barclay Index that is comprised of 535 CTAs. The T-value is 0.6633, indicating no difference in the two means. 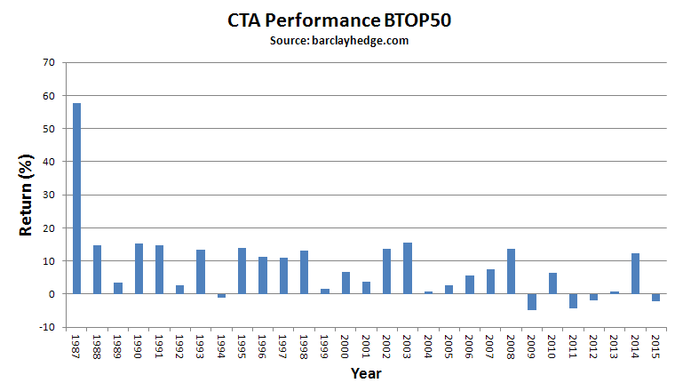 Thus, the argument that the Barclay CTA Top 20 index is more representative of CTA returns is rejected. The variance of returns of the top 20 group is lower, as expected. However, the non-significant results is an indication that they are not able to do better than the large group. This should be expected since they are trading the same markets, mostly with the same tools and strategies. Obviously, some CTAs do better than others by virtue of a distribution of a population. This analysis dealt with averages and average performance and it is not an indication of how a particular CTA or program has performed or will perform in the future.